Benchmarks in London, Frankfurt, Shanghai and Tokyo advanced after Bloomberg News and The Wall Street Journal, citing unidentified sources, said China was offering to cut tariffs and other restrictions on U.S. farm, chemical, auto and other products. They said the U.S. would remove most sanctions on Chinese imports. A deal might be struck in time to be signed by Presidents Donald Trump and Xi Jinping this month, the reports said. But they cautioned the two sides still were negotiating on the issue that sparked the dispute: Chinese plans for state-led creation of global technology competitors. Washington, Europe and other trading partners say those violate Beijing’s market-opening obligations. In midday trading, London’s FTSE 100 was up 0.6 percent at 7,151 and Germany’s DAX was 0.2 percent higher at 11,621. France’s CAC 40 gained 0.6 percent to 5,296. Wall Street appeared headed for a higher open, with futures for the Dow Jones Industrial Average up 0.3 percent to 26,026 and that for the broad S&P 500 index also up 0.3 percent to 2,811. Investors are watching this week’s session of China’s ceremonial national legislature for policy announcements on currency, trade, industrial development and possible economic stimulus. Forecasters expect an official 2019 growth target of 6 percent to be announced. Few major changes are expected, but economists expect more government spending to shore up cooling growth. ASIA’S DAY: The Shanghai Composite Index rose 1.1 percent to 3,027.58 and Tokyo’s Nikkei 225 added 1 percent to 21,822.04. 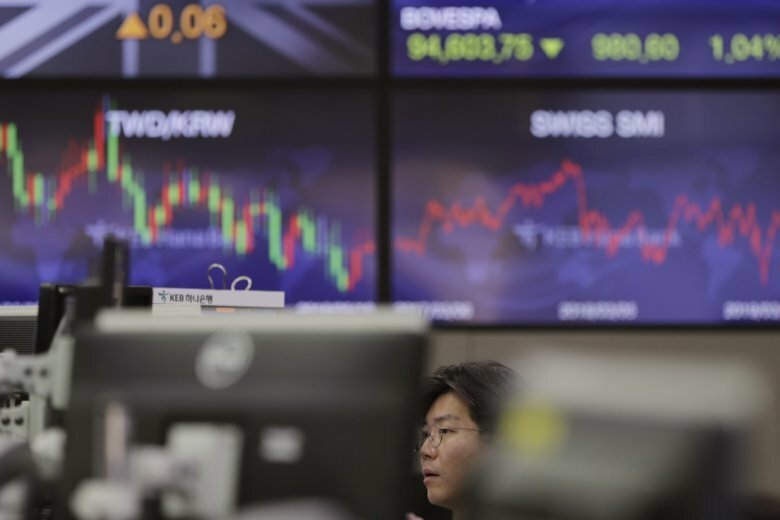 Hong Kong’s Hang Seng advanced 0.5 percent to 28,959.59 and Seoul’s Kospi lost 0.2 percent to 2,190.66. Sydney’s S&P-ASX gained 0.4 percent to 6,217.40. ENERGY: Benchmark U.S. crude gained 32 cents to $56.12 per barrel in electronic trading on the New York Mercantile Exchange. The contract fell $1.40 on Friday to $55.80. Brent crude, used to price international oils, added 52 cents to $65.59 per barrel in London. It lost $1.24 the previous session to $65.07. CURRENCY: The dollar slipped to 111.85 yen from Friday’s 111.92 yen. The euro weakened to $1.1338 from $1.1411.